The top diplomats of South Korea and Japan agreed to pursue the "future-oriented" development of bilateral relations during their phone conversation Friday, Seoul's foreign ministry said amid an escalating spat involving military radar. 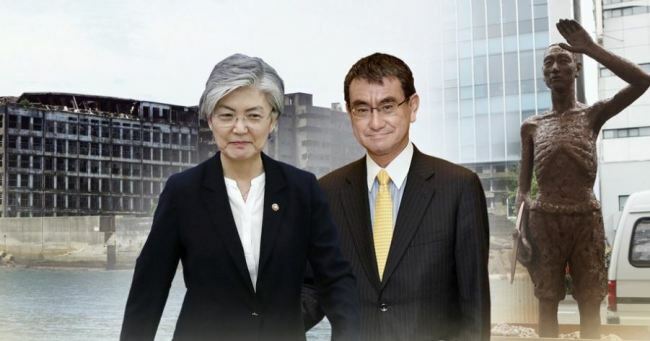 Foreign Minister Kang Kyung-wha and her Japanese counterpart, Taro Kono, discussed growing tensions over the row and South Korea's Supreme Court rulings last year in favor of South Koreans forced into hard labor by Japanese firms during Tokyo's 1910-45 colonial rule. "Regarding the radar issue, the two ministers shared the understanding that South Korea and Japan need to address their differences through consultations between their military authorities," the ministry said in a press release. "The ministers agreed to work together for the future-oriented development of bilateral ties through continued close communication this year as well," it added. Seoul and Tokyo have traded tough accusations against each other, after the latter raised allegations that a South Korean destroyer directed fire-control radar at a Japanese patrol aircraft on Dec. 20.